You should always back up your files. It’s one of the most important things a person needs to do with their electronics. You never know when things will go wrong and you don’t want to lose any of your stuff when such events occur. Thankfully, there are plenty of ways to backup your files and apps on Android. For this list, we’ll take a look at the best Android backup apps. Unfortunately, with native tools becoming more popular, the app scene for this is getting a little weaker. Generally speaking, unless you’re a root user, your best options are usually cloud storage and Google’s native backup, but we talk about that more in depth below! Here are some more extremely useful backup apps for Android! Autosync is a series of backup apps by MetaCtrl. They are available for Dropbox, Google Drive, OneDrive, Box, and MEGA as separate apps. Each one lets you backup files automatically. Files also sync both ways. Thus, if you upload something to Drive, Autosync for Google Drive puts it on your device and vice versa. Users can choose sync intervals, the types of files that go to the cloud, and more. It also includes Tasker support. The premium features include support for files larger than 10MB, multiple folder syncing support, a passcode setting, no ads, and improved support options. There are multiple tiers of premium. A single $1.99 removes ads, $4.99 adds support for larger files and multiple folders, and $9.99 gives you everything. App Backup is actually a decent backup app for applications. It can copy APK files to your internal storage or cloud storage as you need. Those are the actual APKs and install perfectly fine. At least, they installed fine during our testing. You can also share APKs, check the package name, the app version, and date installed. Some additional options include an uninstall option, Material Design, and an auto-backup function in case you want to be lazy with it. This isn't nearly as powerful as root-only backup apps like Titanium Backup. However, this is about as good as it can possibly get for non-root users. The app did crash once during our tests, but it otherwise ran fine. Backup Your Mobile is another basic solution for backup apps for those who don’t need a lot of features. It can backup a lot of things including apps, system settings, SMS, MMS, call logs, and other various bric-a-brac. The UI is fairly simple and using it to backup stuff should only take a few minutes of poking around. It looks antiquated, but it's not like you'll use this app more than a few times. Some have reported the occasional bug. Thus, your mileage may vary. Thankfully, it's free so it won't cost you anything to try it. Easier Backup is basically what the name says. It backs up your contacts. The app works offline, includes support for VFC, and quick export to basically whatever you want. That includes cloud storage, your email, or your PC. The app also has support for 15 languages, Material Design, and more. It's relatively simple to use and we liked how many options you get to manually move your contacts around. Otherwise, there isn't much else to say. This app does one thing and it does it correctly. G Cloud is a cloud storage option, but one specifically for device backups. It can automatically or manually backup your SMS messages, contacts, photos, videos, music, documents, call logs, and other various files. It can even backup your settings in some cases. You can configure automatic backup for favorable circumstances like when your device is charging and also connected to WiFi. The service gives you 1GB for free and you can earn more free storage with various little gags in the app. It also boasts a $3.99 option for unlimited storage. This isn't like Google Drive or OneDrive or anything like that. It's a cloud storage service specifically for phone backup material and that's kind of neat. G Cloud has no association with Google whatsoever. Keep it rolling with some more useful Android apps! Google Photos kind of counts as cloud storage. However, we think it's a special case. This app backs up your photos and videos for free. The only thing Google asks is that you allow them to decrease the quality a little bit. This is an amazing budget option for smartphone shutterbugs. All photos are accessible via the website or the app. That makes them viewable basically everywhere with an Internet connection. You can also download them again whenever you want to or share them to various places like Instagram or Facebook. There is an option to backup photos and videos at the original quality. However, that uses Google Drive space and you have to pay for that. You only get the free storage if you don't mind Google lowering the quality a little bit. Migrate is a handy tool for root users who flash a lot of ROMs. It basically backups up everything. That includes apps, app data, app permission settings, SMS messages, call logs, contacts, screen DPI settings, and even your default keyboard option. You back everything up and the app creates a flashable ZIP file. You flash your new ROM and then flash the ZIP created by Migrate. The ROM boots up, you let the restore process finish, and that's it. This is still a very new app with plenty of little bugs. It is, after all, still in beta. Thankfully, the only people who can even use it are root users so you all know what you're in for here. This competes favorably with Titanium Backup if we're talking about strictly backing up apps and such. Resilio Sync is among our favorite cloud storage apps and easily one of the best backup apps. It works almost exactly like any other cloud storage service. However, instead of backing up to some mystery server somewhere, you back up your files to your own computer. It takes a little while to set up because you need to connect your phone and your computer together so they can sync up. Otherwise it works like any other cloud storage app. You backup your files and they appear on your computer where you can do what you want with them. The files are encrypted as well for an added layer of security. This is a great option for people who like the idea of cloud storage, but don't want large companies holding their private data. Super Backup is another one of the simpler backup apps The interface is functional and easy to use. It includes buttons that backup each thing individually, including apps, contacts, SMS, calendars, and a few others. Users can define where the backups go for easy locating later and you can also schedule automatic backups along with backing up to cloud storage. There have been a few bugs reported here and there, but it’s a simple solution overall. Titanium Backup is an essential tool for root users. It's been stable for ages, receives frequent updates, and has tons of features. Unlike many other backup apps, Titanium Backup is pretty much exclusively for root users without many features for non-rooted devices. You can freeze and uninstall bloatware, backup applications (along with app data), backup to cloud storage, and plenty more. The Pro version comes with far more features, including 1-click batch restore, syncing to cloud storage, and a whole lot more. This is the past and present king of backup apps for root users and everybody knows it. Not much longer til the end of the article, but here are some more recommendations! There are other ways to backup various parts of your device. You won’t typically see the kind of depth that you’d see with one of the applications listed above, but with a little housekeeping, you can have a device that restores pretty much everything within an hour without the help of a backup applications. We’ll cover these briefly but our own Jonathan Feist covers them more in depth in his Android customization series. Android has the capacity to backup all of your stuff for you. You can access the options in the Settings menu of your device. It can backup a bunch of info, like the apps you have installed, some system settings, and more. OEMs such as HTC, Samsung, and LG usually have backup apps pre-installed on their devices as well. You can easily backup your contacts, SMS, passwords, call history, and other stuff. How much you can backup depends greatly on whether you go with your Google account or an OEM account. They're all usually free, come installed already, and usually work pretty well. You can access most of the files on your device. Using a file manager (or by hooking your phone up to a computer in MTP mode), you have immediate access to all of your music (in the Music folder), videos (in the Video folder), and even your photos (in the DCIM folder). It's quite easy to move all of these files to your PC for safe storage while you switch phones. You can also back then up to the cloud (share to the cloud storage app of your choice) and even use your Micro SD card if your phone has expandable storage. It's tedious and requires a bit of technical know-how. However, you will always know where your files are and you can always back them up multiple times. Tons of apps have cloud syncing features all on their own. Many browsers, including Google Chrome and Firefox let you sign into an account where you can sync your Internet history, bookmarks, logins, and other browser data. Apps like Pocket Casts let you sync your podcast subscription list. 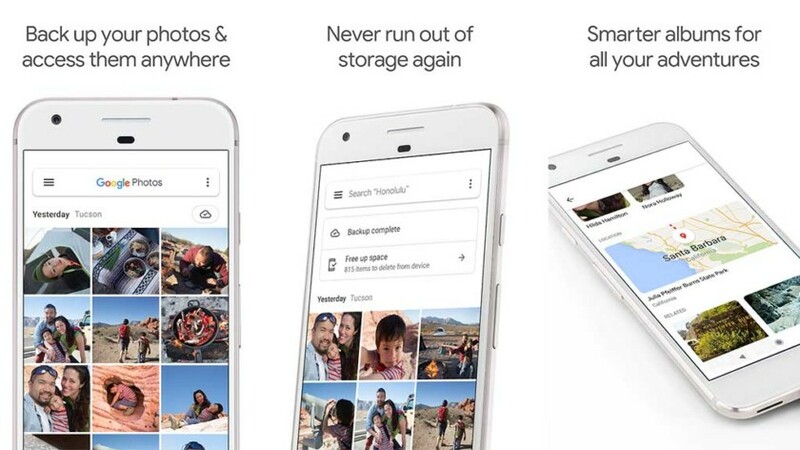 Some cloud storage apps like Dropbox, Google Photos, and Microsoft OneDrive can automatically backup your photos. Many, many games have cloud saving via Facebook or Google Play Games. You can even save your contacts to your Gmail account and they will automatically sync with any phone that logs into your Google account. Passowrd manager apps like LastPass are great for backing up your login data. Before going down the rabbit hole to back up everything, check out what may already be backing itself up on your device! If we missed any great methods or backup apps for Android, tell us about them in the comments! You can also click here to check out our latest Android app and game lists!